Mattress topper, as the name suggests, is a removable extra layer of bedding which is placed on the top of your mattress to provide comfort and combat the stiffness of your mattress. It can be a cushioned layer or a pad which is held either by straps or are simply placed on the mattress. There are many mattress toppers available in the market and it is quite difficult to choose the best type from the ample options. Just like the best mattress protectors, you just have to know what you are looking for. What are the different types of mattress toppers available in the market? First and foremost importance of a mattress topper is that it can greatly enhance your sleeping experience by adding an extra layer of comfort on your existing mattress and can subsequently assuage the discomfort caused by it. Sleeping on the mattress can compress it because of your bodyweight and can diminish the level of comfort provided by it over a time period. To avoid this, a topper is a suitable choice as your mattress remains intact, your body weight is realized mostly by the topper and this increases the longevity of your mattress. If you don’t want to shell out much money to buy a new mattress then you can use mattress topper as an alternative. Although using a mattress topper on the top of your existing sagging mattress can be a temporary solution or just a quick fix, you will have to get a new mattress if your mattress has worn out. It is a note-worthy fact that mattress toppers cannot enhance the core support of your existing mattress and it depends on factors like coil spring, the condition of the material and the density of the foam used in the mattress. Latex mattress toppers are usually expensive, but provide an excellent level of comfort. It is quite difficult to distinguish between natural latex made mattresses and mattresses made of synthetic material. 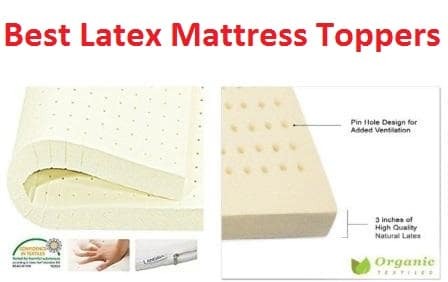 Latex mattress topper can perform two functions vis-à-vis hardening your saggy mattress or softening your stiff mattress to increase the quality of sleep. Most of the latex mattress topper are non-allergenic and antimicrobial and are recommended by doctors for maintaining hygiene levels. You should refrain from buying a latex mattress topper if you are allergic to latex. Latex mattress toppers are much durable as compared to other types. Memory foam is the most popular kind of mattress topper material available and is also the kind that provides extreme comfort while sleeping. Memory foam mattress toppers are costlier than latex toppers and the price can exceed the cost of a whole mattress. Memory foam mattress toppers are especially recommended for those people who have joint, muscular or back pain. There are wide varieties of densities available so you’ll have to choose the density according to your requirement. Wool is a natural material that is soft and comfortable. Mattress toppers made up of wool are expensive as it is a natural material and lasts longer. Wool is the ideal material for those people who have allergies from synthetic materials. Also, wool is resistant to bed bugs and termites so your mattress topper will be free of bugs. Mattress topper made of feathers give exquisite and luxurious feeling and are recommended for the persons who want topper for making their stiff mattress soft. You should refrain from using a feather topper if you are allergic or you need a mattress topper with firmness. There are many varieties of mattress toppers available in cotton and polyester material. Toppers with such material are often easy to clean and are quite affordable as compared to other materials. Toppers of cotton and polyester do not last long and get compressed in a short duration. Egg Crate mattress toppers are specially designed toppers that have little bumps similar to an egg crate. An egg crate topper can be made from memory foam or from basic conventional foam. Although egg crate toppers cannot be compared with toppers made of feather and wool as they do not provide the same level of comfort but can be a good choice if you are running low on a budget as egg crate mattress toppers are rather inexpensive. 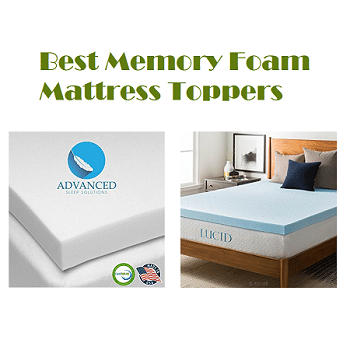 If you want extra support and firmness from your mattress topper then you should consider buying topper made up of memory foam and latex because toppers made of these materials can help you hold your body in a natural posture. If you are the one who wants a cozy mattress topper that moulds according to your body shape then you must look forward to natural material like cotton of a topper made of feathers. Thickness and density play a rather important role in choosing the best mattress topper for you. A topper can be as thick as 8 inches or as thin as 2 inches. If you weigh more than normal people, then you must choose topper with increased thickness and made up of memory foam and latex. The Density of topper is indicative of the support you want from your topper. Some materials are resistant to bed bugs and mites and are easy to clean. Also if you are allergic to synthetic materials, then you can explore options like a mattress topper made of wool or cotton. Some mattress toppers come with covers included in the package and for others, you need to buy the covers separately. Covers are not essential, but they can be bought to add an extra layer of safety to your mattress topper to protect from stains which can be caused by daily activities. Also, covers are made of 100% cotton and can be found in various patterns to match the interior designing of your room. Body heat can be an important factor while buying a mattress topper, especially if you live in a tropical region and face severe summers. Mattress toppers made of latex and memory foam traps heat and can make you uncomfortable during warm weather while materials like wool and feather can work through all seasons as they are warm in winters and cool in summers. Now that you know how to choose the best mattress topper out of all the options available, here is a list of top 10 mattress toppers that are in demand in the market. Price can be an important factor while buying a mattress topper as the price range of the toppers can be anywhere between $30 to several thousand dollars. Try to buy the topper that meets your requirement and should not look forward to buying an expensive topper. The Extra Plush Rayon from bamboo fitted is a mattress pad that is 100% made in the USA and provides extreme luxurious comfort to its users. The material used in this topper is blended rayon from bamboo fabric. The speciality of this material is very soft to touch and offers a comfortable sleeping experience. The bamboo fabric regulates temperature and keeps in check the warmness in case you have a mattress made up of material like tempupedic. The Extra Plush Rayon mattress topper is stuffed with RevoLoft Cluster Fibre filling in ample amount with the help of an extra engineering process that traps air in the balls of fibre so that the topper can retain its shape and also regulates air much better than any other topper available in the market. The full weight of Plush Rayon bamboo fitted mattress topper is 25 oz. per square yard. The backside of the topper is made up of 50% of cotton and 50% of polyester which makes it easy to clean. The bamboo mattress pad should not be cleaned with any softener. It can be easily washed in warm water using front load/ high capacity washers which are idle for the material used in the mattress topper. The mattress topper measures 23.1 inches in length, 20.1 inches in breadth and 10.5 inches in height. It is the ideal height and it fixes comfortably on your existing mattress. It is available in seven different sizes vis-à-vis Twin, Twin XL, Full, Queen, Olympic Queen, King and California King. You can choose the size according to your convenience. The cover of the Plush bamboo mattress topper is filled with hypoallergenic alternative down cluster fibre which keeps away bed bugs and mites. The natural bamboo fibre helps in regulating temperature, does not cause baking during your sleep and keeps the temperature rather cold. The double needle baffle box stitching keeps the topper in place and prevents fill from shifting from its place. If you are using a memory foam mattress, then this mattress topper can diminish the heating effect and can help you tremendously. It is one of the top best mattress toppers available in the market today. The Extra Plush Rayon from bamboo fitted mattress topper is just the right mattress topper for you if want to enjoy a peaceful and comfortable slumber during a hot afternoon or a deep sleep during a night when you want to get rid of the day’s fatigue. The Home Sweet home dreams thick hypoallergenic down alternative mattress topper is an imported mattress topper made just to provide you the comfort and sound sleep you need after a hectic day. The mattress topper is made up of 100% microfibre and is filled with hypoallergenic down alternative fibre filling. There are four sizes available for this mattress topper- Twin, Full, Queen and King and you choose according to your requirement and according to the size of your existing mattress. The fibre polyester filling ensures that you get proper support as the material is made out of super soft 100% microfibre. The mattress topper is easy to clean and can be washed in any washing machine. The hypoallergenic material keeps bed bugs and mites away so that you can enjoy a good sleep without any disturbance. Also, the material is environment-friendly and does not cause any harm through any kind of toxic material. The mattress topper is 2 inches thick, provides required support to the back and keeps your posture maintained in a natural way. The topper comes with anchor bands that are attached at each corner to provide a secure fit on your existing mattress and prevents the topper from slipping from its position and from shifting. It is a durable mattress topper and is sure to last long as it is well stitched into baffle box to prevent the fibre from shifting. The standard queen size measures 60 inches in length, 80 inches in width and is two inches thick and fits comfortably on any mattress up to 18 inches. It is a light weight mattress topper and weighs just 8.8 pounds. The mattress topper is manufactured by Home Sweet Home Dreams Inc which is a reputed company and manufactures various kinds of mattress toppers for customers. It is a great product for winter and fall seasons as it keeps and holds body heat to provide a warm sleeping experience. If you are troubled by your stiff mattress and the pain it has caused to your neck and back then the Home Sweet Home Dreams Thick Hypoallergenic down Alternative mattress topper could be a solution as it turns your mattress into a fluffy and comfortable one. You would as if you are sleeping on a cloud. Contrary to the level and the level of comfort you get with this topper, it is fairly affordable and inexpensive. This superior quality mattress topper is one of the best mattress toppers available in the market. Also check out some of the best mattress protectors. Sleep Innovations is a reputed and known company that has been in the industry since 20 years. After much research and studying sleep patterns, they manufacture superior quality and more than comfortable mattress toppers made of different materials. Another amazing product by Sleep Innovations, the 4-inch dual layer mattress topper is an ultra-soft mattress topper. It is filled with two inches of cooling gel memory foam which is combined with a two-inch layer of fluffy fibre which helps you get a deep, comfy sleep. The topper comes in five different sizes, namely Twin, Full, Queen, King and California King. The number of options in size makes it easy for you to choose the best mattress topper for your existing mattress. The mattress topper measures 80 inches in length, 60 inches in width and 4 inches height and weighs just 23 pounds. The dual layered mattress topper is made with the most adaptable and inventive foam bedding available in the market. It blends perfectly with any kind of mattress and supports different sleeping styles. The topper is covered with a snug fit cover which can be removed for washing purposes. Also, it is very easy to wash the cover and a normal washer and dryer can be used to wash it. The four-inch dual layer mattress is the ideal mattress for the people who like to sleep on the side, back or stomach as it offers complete support to the body. The foam that is stuffed in the mattress is made in the USA and the topper comes with a 10 years limited warranty which is evident from the fact that is a long lasting and durable mattress topper. The dual layer mattress topper provides, gentle and pressure relieved support to the body. It is an affordable product that carries a feeling of luxury with itself; it is so soft that you will not want to wake up in the morning. The chemical content of the foam has gone through a number of tests and meets all the safety standard set by the authorities. If you like to sleep snugly lowered in your mattress,and then the mattress topper by Sleep Innovations is just right for you. Also, if you have a firm mattress and your body aches in the morning when you wake up, then the four-inch dual layer mattress topper can work like a charm to make your existing more comfortable by making it soft and fluffy. Manufactured by Cloud9 Bedding Visco Elastic Memory Bed Company, the gel infused Visco elastic memory foam mattresses are the epitome of comfort. The exclusive formula used while manufacturing the topper makes you feel like you are floating on cloud nine, sailing forth into a sea of dreams. The mattress topper is made 100% in the USA and does not contain any toxic ingredients. The new foam odor will disappear very soon if the topper is aired out. The memory foam mattress topper is available in six different sizes vis-à-vis Twin XL, California King, Full, King, Queen and Twin. You can choose out of these sizes to select the best size for your mattress. The queen size measures 80 inches in length, 60 inches in width and 3 inches in height. The cool gel visco-elastic memory foam technology is known to heal painful pressure point better than the other mattress toppers available in the market. It does not store body heat and regulates the temperature on the topper so that you can sleep cooler, peacefully without tossing in your bed. In normal temperature, it remains firm but when you apply pressure to it, it adapts the temperature according to your body temperature and also molds itself to your body shape so that you can sleep comfortably to enjoy a good night’s sleep. When you sleep, your body weight is evenly distributed all over the topper which relieves the pressure in your body. The innovative gel infused Visco elastic memory foam technology helps you in getting rid of back pain and increases circulation so that your body can rest. You can fit the Cloud9 mattress topper over any mattress and it enhances the level of comfort you get while sleeping especially if you have a stiff existing mattress. The innovative technology of “Featherlight Sleep System” helps you in sleeping comfortably and cradles you towards deep sleep. The advanced technology has been approved by many scientists and doctors as a groundbreaking feature, especially for insomniacs. It is recommended that if you weigh more than 200 lbs then you should buy a 3 inch Visco elastic memory foam mattress topper, if you weigh less than 200 lbs then you should definitely buy 2 inch mattress topper and if you weigh more than 250 lbs then the mattress topper of height four inches would be the right choice for your body. The gel infused mattress topper is the best and affordable mattress available out there. The twin XL 3-inch iSoCore 3.0 Memory Foam mattress pad is a super soft, luxurious and resilient mattress topper. It is designed so as it adjusts according to the contours of your body, providing you with the complete comfort. You spend one-third of your life on your bed and iSoCore with the 3.0 Memory Foam mattress pad is trying to improve this part of your life. The luxurious Visco elastic material which is stuffed inside the topper reacts to your body temperature and helps effectively in reducing pressure point providing your body with the complete rest and a deep sleep. The iSoCore memory foam mattress pad is a durable product and comes with a three-year limited warranty so that you don’t have to worry regularly after buying it. There are six sizes available for you to choose from. You can select any size from Twin, Twin XL, Full Size, Queen, King and California King according to the size of your bed and your existing mattress. The mattress pad is designed with the help of advanced technology and one of the finest materials to offer soft, supple contouring comfort at a very affordable price. If your current mattress is stiff, hard, lumpy, transfers motion and you wake up with body pain because of your mattress, then iSoCore line can help you effectively in getting rid of these problems.The material that is used in the topper is safe for your health and has been through various safety tests conducted by the EPA and CPSC, this ensures the safety of you and your family members. 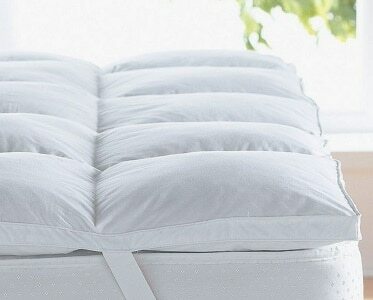 The mattress topper comes packed neatly and gets fluffy within no time. Also, it is odorless as many memory foam mattress release some odor while they are new. 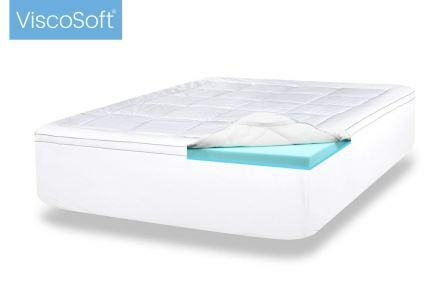 The speciality of the iSoCore 3.0 memory foam mattress topper is that it adjusts itself according to the contours of your body and comes right to its original shape as soon as you get it. This feature makes it very comfortable for you and also helps you in keeping your posture natural. With the affordable price and the good quality material used while manufacturing this mattress topper, it is worth buying,especially if you are troubled by your old mattress but doesn’t want to spend much money for buying a brand new mattress. iSoCore brand is a trustworthy brand which believes in quality and craftsmanship of their products. The DreamFoam mattress topper is exquisite and comfortable and sleeping on it feels like sleeping on a cloud. It is two inches thick and provides extreme comfort to the body. It is stuffed with soft visco-elastic memory foam which is known for being soft, comfortable and thus increases the quality of your sleep. 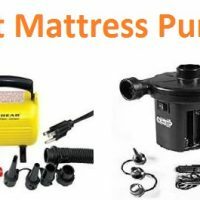 It can bring a change to your existing mattress and can turn your hard and stiff mattress to a feather-like soft mattress.The foam that is used to stuff the topper is chemical free, high quality and is certified by Certi-purUS.Certi-pur US is indicative of the fact that the foam is made without ozone depleters, PBDEs, TDCPP or TCEP (“Tris”) flame retardants, mercury, lead, heavy metals, formaldehyde or phthalates regulated by the Consumer Product Safety Commission. The foam does not containchlorofluorocarbons (CFCs) and low VOC. The DreamFoam mattress topper comes with three-year warranty and is sure to last long. It is a made in USA product. The foams used by DreamFoam are performance tested, durability tested, emissions tested and content tested by various independent as well as accredited laboratories. The memory foam topper fits well over your existing mattress and you can choose from eight different sizes available, namely Twin, Twin XL, Full, Full XL, Short Queen, Queen, King and California King.The weight of the queen size mattress topper is just 12.6 pounds. The foam used in manufacturing the mattress topper is soft visco-elastic memory foam which retains its shape as soon as the pressure is released and adjusts to the contours of your body easily providing you complete comfort. It is decently stuffed and your body weight is evenly distributed all the mattress topper thus eliminating any kind of back pain or body ache. 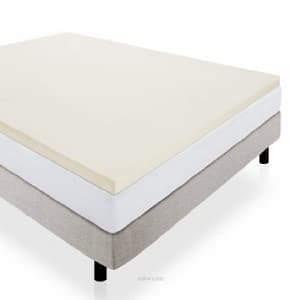 DreamFoam stands firmly over the quality of their products and offers a three-year warranty on DreamFoam 2” Gel Swirl Memory Foam mattress toppers so that you can rest easy.The warranty ensures that it is a durable product. It is an extremely plush mattress topper and does not emit any bad odor of foam. It can also be placed on a massage table for experiencing more comfort. It is highly recommended for the people who are suffering from sciatic symptoms and other joint and back ache. All in all, it is a good and affordable product that can be bought for adding comfort to any kind of sleeping place and for increasing the durability of your current mattress. The Pinzon Overfilled Microplush Mattress Pad is a revolutionary extremely comfortable mattress pad that is made of superior quality material. The top of the mattress topper is 100% polyester, the bottom is filled with 100% olefin, sides are stuffed with 90% polyester and 10% spandex sides which provide pleasant feeling and snug to the body. The mattress pad is sewn with microplush fabric which is very soft to touch and the topper is overfilled for providing extra comfort. The polyester which is stuffed in the mattress topper retains its position as soon as you get up and otherwise adjusts according to your body shape. The loft-retaining polyester overfilling ensures that you sleep in a restful and congenial manner so that you can wake up energised and invigorated. The mattress is an end to end box stitched with mitered border to prevent the polyester filled from shifting from its position. 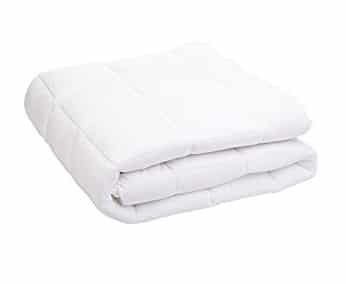 The elasticized edges make the pad function as a topper and a mattress protector. The microplush mattress pad will easily fit over deep mattresses like pillow tops. Deep pockets easily fitx any mattress up to eighteen inches deep and also allow the mattress topper to double as a mattress protector for multipurpose convenience. The Pinzon Overfilled Microplush Mattress pad is available in queen size, which measures 20 inches in length, 20 inches in breadth and 9.2 inches in height and weighs just 6.8 pounds. It is recommended that the microplush mattress topper should be professionally washed or it is better to get the topper dry-cleaned on a regular basis to keep it clean and free from germs and mites. The build quality of the material used is far better than the other mattress toppers in the market. It comes in bright white color which goes with any color and blends perfectly with the surroundings of your room. Also, it comes odorless, unlike other mattress toppers which need to be aired out because of the chemical odor which is released by them. It can convert your stiff mattress into a soft and cozy one and can also increase its longevity if your mattress is in bad shape. Pinzon is a brand by Amazon.com and is famous for manufacturing quality and affordable bedding and bath products. The company has gained a good reputation among customer through their innovative products. Pinzon Overfilled Microplush Mattress Pad is a must buy products for people seeking comfort combined with utmost luxury. The memory foam stuffed in the topper is certified by Certi-Pur US and does not contain any type of ozone depleter, formaldehyde, PBDE, TDCPP, TCEP flame retardants, mercury, lead or any other heavy metal which is prohibited by CPSC. Less than 0.5 part per million of VOC is emitted for indoor air quality. The high quality foam ensures that no damage is caused to the environment. The mattress topper is available in six different sizes Twin, Twin XL, Full, Queen, King and California king so that you can select the size as per your bed size. The queens size measures 78 inches in length, 58 inches in width and 2 inches in height. Weight of the mattress topper is 12 pounds and the foam density is 3 lbs. Also, toppers by Advanced Sleep are usually one inch shorter than your mattress so as to accommodate snug placement of fitted bed sheets.Advanced Sleep ensures that the product is durable by providing sixty days money back satisfaction guarantee and three years manufacturer warranty. In case you face any difficulty or you have any query related to the mattress topper, you can contact the customer service of the Advanced Sleep. Their customer service team is professional and you can expect prompt reply from their side. Memory Foam Mattress Topper by Advanced Sleep Solutions is one of the best memory foam mattress topper available in the market. The innovative mattress topper provides superior sleep comfort, relieves pressure points, relaxes muscles, and helps spinal alignment. It is specially designed for the people who sleep with restless sleeping partners, pets or kids as it minimizes motion transfer. The open cell structure design of the topper expands it as pressure is applied, thus increasing air flow and provides a cool sleep experience. It is best suited for warm weather and for all season. 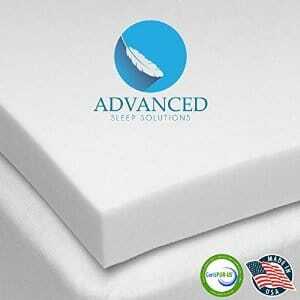 Mattress topper by Advanced Sleep Solutions is odorless and does not emit any off-putting smell even when it is new. Also, it does not absorb smell caused by moisture and sweat during the night’s sleep. The futuristic open cell system design and increased air flow minimizes heat accumulation. Heat and moisture that gets trapped in the topper after a good night’s sleep get dissipated three times faster than any other conventional memory foam toppers.The latest polymer technology used while making the memory foam mattress topper suppress the stiffness of your existing mattress and maximize the air circulation. The top of the mattress topper is 100% polyester, bottom is filled with 100% olefin, sides are stuffed with 90% polyester and 10% spandex which makes it very comfortable and soft. It measures 20 inches in length and 20 inches in width and has deep pockets which helps it in adjusting over your twin mattress. The topper is available in six different sizes, including Twin, Full, Twin XL, Queen, King and California King and you can choose any size according to the size of your mattress. Each size is differently priced but there is not much difference between the prices of different sizes. 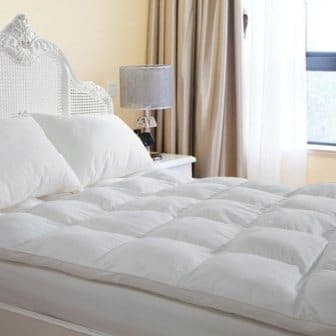 Pinzon, the manufacturing company, advises the customers to not to wash the mattress pad at home and get the topper professionally washed and dry cleaned for increasing the durability. Also, since it is overfilled and extra fluffy it is rather difficult to wash it at home in a washing machine. If you want to add a touch of more comfort to your existing mattress then the Pinzon Overfilled Microplush Mattress Pad is highly recommended. As compared to its features and the level of luxury aspect of it, it is rather inexpensive and affordable. Instead of spending a grand on a new mattress or a new bed you can buy the Pinzon mattress topper and save your money. Pinzon Overfilled Microplush Mattress pad is extra soft and comfortable and can turn your old mattress into an inviting and cozy bed for you to enjoy a deep sleep. It is overfilled to make it extremely soft and fluffy and you will feel like you are sleeping on a cloud. The microplushfibre is sewn together and overlaid on the top of the mattress topper. What makes this mattress pad durable is the fact that it is stitched from one end to the other end with a mitered border that prevents the filling from shifting to one side and you will not feel the hollowness anywhere on your mattress topper. Also, the microplus pad comes with an extra layer of protection which keeps the topper away from any kind of stains and spills which can hamper the longevity of the topper, your mattress will also remain in peak condition and fluffy for much longer time. Most of the mattress toppers lose their shape after some time and begin to sink down, but the Pinzon Mattress Pad retains its shape unlike other mattress toppers and lasts longer if kept with proper care. The foam used in stuffing the topper is 100% polyurethane foam which is certified by Certi-PUR US and has been tested by accredited laboratories and meets all the standards for content, emissions and longevity. 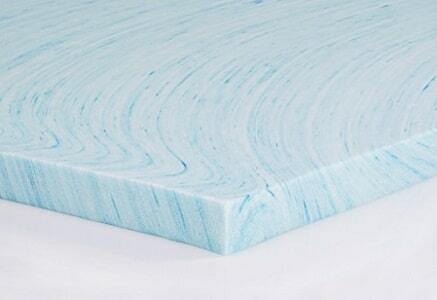 The Certi-PUR US ensures that the foam used has low VOC emissions for indoor air quality and does not contain any ozone depleters, PBDEs, formaldehyde and any other metal which is prohibited by the Consumer Product Safety Commission. It is very important to choose the appropriate size while selecting a mattress topper because you do not want it to be too small or too big for your best innerspring mattress. The Lucid 2 inch foam mattress topper is available in seven different sizes, including Full X-Large, Twin X-Large, California King, Full, King, Queen and Twin. The material used to stuff the mattress topper is naturally hypoallergenic and keeps mites and bed bugs away so that you can sleep peacefully. Unlike other mattress toppers, it does not start sinking after some time. Also, it comes with three year warranty that protects you from any kind of manufacturing defects. Lucid will repair, replace or refund if the product is found to be defective in material or craftsmanship. The mattress topper is cut an inch shorter on each side to make sure that your sheets fit comfortably over the topper. Lucid uses an advanced open cell technology design which regulates air flow and helps the topper in retaining its shape as soon as pressure is relieved from it. It also prevents body impressions from forming and staying on the mattress. It can be a good alternative for improving your current mattress. Although it is just two inches high, but be sure that it will transform your current hard mattress into a soft and cozy place for sleeping and will also extend the life your mattress so that you don’t have to shell out money to buy a new mattress. The Lucid 2 inch Foam mattress topper is a two inch thick solid foam mattress topper which is made of traditional foam which can soften up your hard mattress and adjusts itself according to your body weight and body position. Lucid mattress topper provides a comfortable deep sleep and relieves you of pressure so that you wake up fresh and rejuvenated. If you go out for camping frequently then it is the recommended mattress topper. You can also place it in your RV for experiencing better comfort during long rides. The Lucid 2 inch foam mattress topper is designed in a way that it correctly aligns the spine by supporting head, neck and shoulders. In this product guide for choosing the best mattress toppers, we have mentioned the top 10 best mattress toppers which are trending in the market and have received many positive reviews from customers. The aim of this article was to make aware everyone about the details of the mattress toppers, what should be the parameters that should be taken into consideration while buying a new mattress topper and the top mattress toppers that are currently ruling the market. All the mattress toppers enlisted above serves the purpose of providing a better night’s sleep for customers who cannot afford to buy a brand new bed or a mattress. 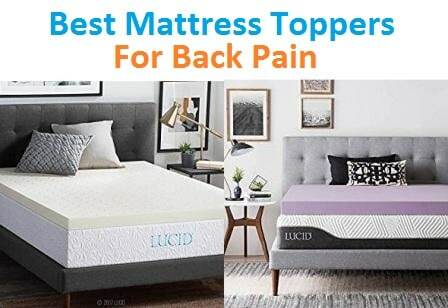 Apart from being super affordable and comfortable, the mattress toppers are also recommended by many doctors for getting rid of health problems like joint pain, insomnia, back pain and body ache. When the old mattress starts wearing you start experiencing troubled sleep and you might wake up with a body pain thus ruining the day for you. The mattress toppers can work wonders by eliminating the need to buy a new mattress and by subduing the stiffness of the current mattress. It depends on your preference whether you want to buy a firm mattress topper or a soft one. This debate has been going on for ages and nobody has reached to any conclusion. It completely depends on you as you need to figure which category out of two works for you.A lot more depends on the material of the topper and how well it is stuffed to comfortably support your body weight. Most of the people buy a mattress topper for increasing the life of their current mattress. Innerspring mattresses, for example, get compressed easily and lose the ability to provide you comfort. After a time period, they refuse to adjust according to your body shape which can pain and deformities in posture. Mattress topper can help you effectively in getting back the comfort and deep sleep, although they can never be the solution to mattress related problems like sagging, sinkholes and springs poking from your current mattress. Apart from increasing the longevity of mattress, the other reason why people choose mattress topper is to adjust the level of comfort provided by the mattresses. 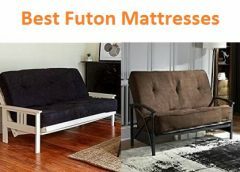 We hope that this article must have cleared all your doubts regarding mattress toppers and now you can easily buy the best mattress topper for yourself. Most of the mentioned products are decent products which can last a lifetime you take good care of them. It is advised to check cleaning instructions before buying. Always check whether you can wash the mattress topper at home or it has to be dry-cleaned and do accordingly for increasing the life of the topper.Maintenance of a mattress topper can be a pain as not all toppers can be washed at home. Even if you try to wash at home, chances are it will not be in your washer and you might end up ruining your mattress topper. Getting the toppers dry cleaned also increases the maintenance cost and it should be considered before buying the perfect mattress topper for yourself. The Plush Durable Premium Hotel Quality Mattress Topper from Duck & Goose Co, Hypoallergenic Down Alternative Fiber with 10-Year Warranty, Queen Size, 2-inch H helps the user to wake up really fresh after having a whole night rest comfortably. It serves as an ideal mattress topper for beginning the day after waking up fully energized and refreshed. It makes a lot of difference to how the user is able to spend his/her day. The Duck & Goose Company makes this mattress topper from a very high-quality material which makes the mattress topper highly durable. The mattress topper contains 1400 gram per square meter (gsm) of very soft and luxurious microfibers which has been generously filled into it. 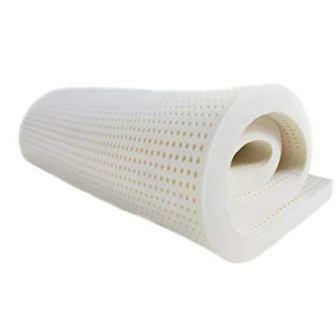 This padding for mattress delivers a very high level of comfort and in order to take care of the health of the user, it contains an anti-microbial barrier against the dust mites. This ensures a high level of protection against allergic reactions for the user. The size of the Queen Mattress Topper is 60 x 80 x 2 inches and it weighs 11.8 lbs while the package dimensions are 25 x 22.5 x 10.6 inches and the color of the mattress topper is milky white. The twin size has product dimensions of 39 x 75 x 2 inches and weighs 7.7 lbs. and the package dimensions are 23.6 x 18.6 x 4.4 inches. The Full size has product dimensions of 54 x 75x 2 inches and the weight is 10.3 lbs while the package dimensions are 24.3 x 18.6 x 6.3 inches. The King size has product dimensions of 76 x 80 x 2 inch) and the weight is 14.6 lbs while the packaging dimensions are 18 x 14 x 4 inches. The mattress topper has a very secure as well as the adaptable type of a fit. The stitching design which is square shaped ensures that the soft microfiber filing in the mattress topper would stay at its place and not move around. This not only protects the user’s mattress but also maintains a very high level of extreme softness to enhance the comfort level for the user. The anchor bands are there to make sure that the fit is very secure. The mattress topper has the capacity to adapt to any type of mattress as long as it has a depth between 6 inches and 22 inches. 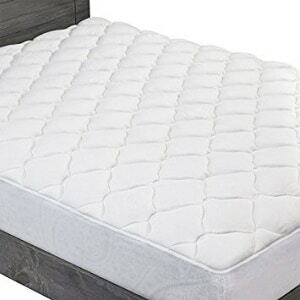 The 4-Inch Queen Luxury Dual Layer Gel-Infused Memory Foam Mattress Topper from ViscoSoft, CertiPUR-US Made in the USA, Includes Quilted, Down-Alternative Pillow Top Cover has got 2.5 inches of gel-infused memory foam and another layer of a fluffy down alternative which is 1.5 inches thick. This gives the ability to relieve pressure to the mattress topper as a result of this plush layer. The comfort provided by this mattress topper can be rated as a 5-star high-density comfort which lets the user enjoy deep sleep the entire night and wake up totally rejuvenated. 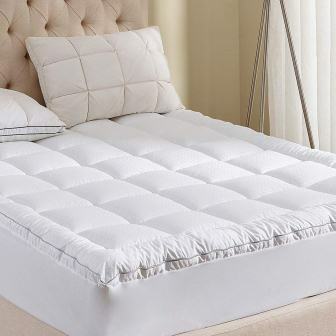 The top layer is composed of a high-quality down alternative-filled cover which has been quilted and it is made of 100% sateen cotton, 300-thread count fabric which is hypoallergenic and allows a high level of protection to the user from dust mites and allergens. This quilted cover is also machine washable. 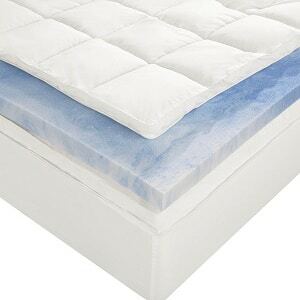 The gel-infused foam used in this mattress topper is CertiPUR-US which means that no toxic materials like mercury, lead and other heavy metals, PBDEs, TDCPP or TCEP (“Tris”) flame retardants, ozone depleters, formaldehyde, phthalates regulated by the Consumer Product Safety Commission, etc. have gone into its manufacture and that it has less than 0.5 parts per million (ppm) Volatile Organic Compounds (VOC) emissions for indoor air quality. It is Made in the United States and exhibits a superior level of heat transfer capability as compared to many other types of memory foams in the market. The mattress topper allows a very soft and luxurious feel to the user who enjoys a very comfortable and deep sleep throughout the night. The elastic straps conveniently located on the inside of the cover offer security to the memory foam portion of the cover. There is also a very strong elastic band which goes around the skirting which offers protection to mattress topper on any kind of mattress which is less or equal to 18 inches of thickness. The quilted cover has a high level of breathability which helps to keep the user in a cool environment and lets him/her enjoy a perfectly deep sleep. The manufacturer offers a 60- day return guarantee if the user is not satisfied. The warranty offered on this product is a limited warranty covering defects in material and workmanship for a period of 3 years. The Pure Green 100% Natural Latex Mattress Topper, Soft, 2″ Queen Size from Sleep on Latex is made from 100% natural latex which is an extremely durable material and is far more durable as compared to the regular polyurethane foam or memory foam. On the LGA physical properties test, it scored 99/100 which goes to show that it is very durable and exhibits a very high level of performance. In short, it has the capability to outlast the mattress it is used to top. The natural latex used in this mattress has been harvested in Sri Lanka. As opposed to natural latex, the synthetic latex is produced from petrochemicals. The user gets the best experience from using natural latex. It is highly supportive and provides a high level of liveliness besides being durable. In many cases, some synthetic latex is mixed with natural latex and it is still marketed as natural latex. In this mattress toppers, there are no fillers either. Only 100% natural latex is used. The effect of the filers is to water down the quality of latex foam and while it fills the available space, this mixing reduces the performance of natural latex. The product dimensions are 60 x 80 x 2 inches and the weight of this 2 inches thick mattress topper is 25.9 lbs. It has been tested by many recognized laboratories internationally and it has been found to conform to the strictest of the world standards. It is therefore very safe based on such extensive and strict testing. The standards related to performance and aesthetics for a perfect latex foam are multiple. This 100% latex foam produced in the Sri Lankan factory of the manufacturer blends all these standards and ensures conformity to all of them. 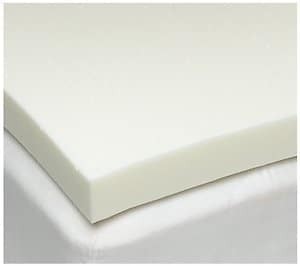 The 100% latex foam used in this mattress topper has been manufactured using the Dunlop process which gives a foam that has a high level of spring action. However, it is not bouncy which could happen if the latex is produced using the Talalay process. The pure green latex foam used in this mattress topper is made in mounds. Research has shown that this type of molded latex foam is high superior as compared to the ‘continuous pour’ latex foam. The latter does not have the required springiness as in the 100% natural latex foam as it is prepared using synthetic latex along with fillers. The Mattress Pad Full Size 400TC Cotton Top 3M, Hypoallergenic, Water Resistant, 46oz Down Alternative Filling Pillowtop Mattress Topper from Witone, Cover-Fitted Quilted 8-21-Inch-Deep Pocket is The Mattress Pad Full Size 400TC Cotton Top 3M, Hypoallergenic, Water Resistant, 46oz Down Alternative Filling Pillowtop Mattress Topper from Witone, Cover-Fitted Quilted 8-21-Inch-Deep Pocket has got a top cover which is made out of 100% cotton. This top is made out of premium quality and long-staple cotton as well as a high=density Jacquard fabric which is extremely skin-friendly 60S*80S Sateen and it is so soft and plush that it is safe to contact directly with baby skin. The thickness filing is a 450 gram per meter square (gsm) 3-D crimp hollow lofty Down alternative poly which is extremely flexible and comfortable and very soft to touch. This filling is protected with squared quilting which stays fixed and does not run or shift. The Product Dimensions are 39″x75″+16″(Pocket Depth) for Twin size weighing 3.05 lbs. The Twin XL size is 39″x80″+16″(Pocket Depth) weighing 4 lbs. This mattress topper is also available in the Full size and its dimensions are 54″x75″+16″(Pocket Depth) weighing 5.17 lbs. The other sizes available are Queen, King and California King with product dimensions of 60″x80″+16″(Pocket Depth), 78″x80″+16″(Pocket Depth), 72″x84″+16″(Pocket Depth) with weights of 6.12 lbs, 7.52 lbs and 7.29 lbs. respectively. The packaging dimensions for the Full size are 16.1 x 13 x 5.9 inches and the weight is 5.08 lbs. Thanks to the 3M technology, water can be quickly wiped away and it would not let the mattress soak for any spill of water less than 200 ml. For this reason, users can enjoy their breakfast in bed without any fear. 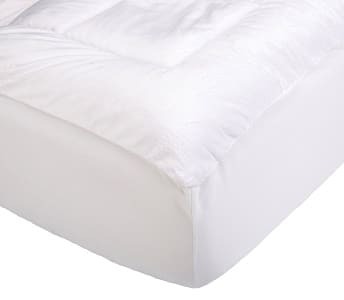 This mattress topper is Hypoallergenic and protects the user from dust mites and other allergens. It is water resistant and possesses anti-microbial properties keeping the user healthy and well. It is extremely soft to touch and feel and completely noiseless. 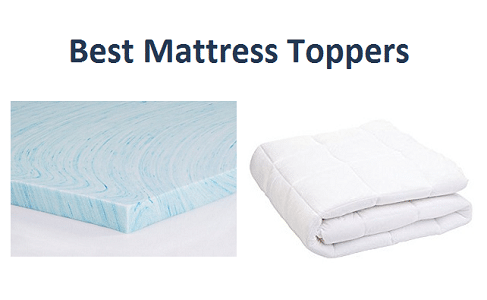 The mattress topper has got stain protection and is made out of 400TC Nature Cotton. It is certainly the best choice among mattress toppers for users wanting to enjoy a full night of deep and sound sleep. The mattress pad is anti-slip and is highly breathable. IT uses Swiss Cooling technology as the breathable fabric adjusts to the body temperature of the user and if the user heats up, it would wick the moisture away to keep the user cool. If the user cools down, the rate of wicking the moisture decreases enabling teaser to stay warm. The 4-Inch Memory Foam Mattress Topper, Queen from Best Price Mattress is made out of a 1.5-inch layer of memory foam as well as a 2.5-inch layer of high-density foam giving it the capability to both acts as a body contour as well as a highly supportive mattress topper. This mattress topper has got a polyester mesh cover which is zippered and it enables a comfortable and deep sleep. Both the 1.5-inch-thick memory foam and the 2.5-inch-thick high-density foam layers have 5 years limited warranty offered from the manufacturer. This warranty is valid for defects due to material and workmanship. The memory foam is a great surface to sleep on and when the temperature is rather normal, it is a bit firm. However, as the user lays down on it, it immediately starts to adjust to the body temperature of the user. The Twin size mattress topper is 39″x75″x4″ while the Full size one is 54″x75″x4″. Two other sizes are available which are the Queen size with product dimensions of 60″x80″x4″ and the King size with product dimensions of 76″x80″x4″. The item weight of the Queen size is 22 lbs. The foam used in this mattress topper is CertiPUR-US Certified which means it does not contain any toxic material and has got a very low level of Volatile Organic Carbon emissions which are less than 0.5 parts per million (ppm) in the indoor air. The two layers of the memory foam and the high-density foam enable the mattress topper to react to the body temperature of the user as the user lays down on it and starts to take the shape of the user’s body. This way, the weight of the user gets very evenly distributed throughout the surface and thus the pressure points are greatly relieved. This feature helps the users to sleep without the need to toss and turn throughout the night. A very deep and sound sleep is thus ensured and is followed by the user waking up fully refreshed and rejuvenated and ready to face a hectic day ahead with gusto. The responsive action of the memory foam is instrumental in isolating the body motion and thus, this mattress topper is ideal for sleep partners who do not have to get affected by the movement of each other on the topper. The ventilation and air flow feature of the memory foam is instrumental in keeping the user at just the right temperature throughout the night.